1. Life Skills Journal of Psychology is a peer reviewed journal that involves both Turkish and English researchs in the fields of psychiatry, psychology, psychological counseling and guidance, social work, psychiatric nursing, child development, early childhood education and special education. 2. 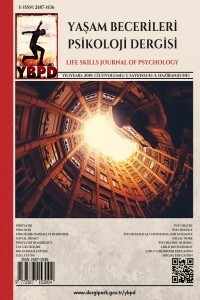 Life Skills Journal of Psychology is being published twice a year, in June and December. However, in case of need, the journal publishes special issues as well. 3. Life Skills Journal of Psychology is an open access journal . 4. Life Skills Journal of Psychology receives submissions that are not previously published or sent for a submission. 5. Life Skills Journal of Psychology does not pay a fee to the authors or reviewers for their submissions. 6. Authors owns all of the copy rights of the articles. The first publication right belongs to the journal. 7. Life Skills Journal of Psychology includes articles and all of the responsibilities of those articles belongs to the authors. 1. Life Skills Journal of Psychology accepts, such as research article, case report, review, conference paper, thesis paper, letter to the editor, book review, systematic reviews and meta analysis. The research that has been presented in an conference or convention but the whole text has not been published in the conference book, can be submitted, yet the name, place, and the date of the conference must be stated as a footnote in the first page. If the research is a masters or doctorate thesis, this detail must be expressed in a footnote in the first page. 2. Life Skills Journal of Psychology evaluates articles for their scientific content and ethical rules with their ethics committee, and then sends to two different reviewers. Double blind peer review system is used in the journal when evaluating an article. Author does not know which judge is reviewing their article, and the judges also do not know whose article that they are evaluating. Editor is responsible for this confidentiality. The articles get published when both judges state positive feedbacks. In case of a negative feedback from one of the judges, the article gets sent to a third judge. The articles that are reviewed early and accepted are published under the title of preview. 3. Life Skills Journal of Psychology requires articles to follow American Psychological Association (APA)6th edition when they use in text citation, table, and references. For a research to be evaluated, it must contain less than 15% of citation except the abstract and refences sections. 4. Life Skills Journal of Psychology accepts articles from authors who edits their papers accordingly to the punctuation rules and then login to the system of dergipark. Then, the authors should submit their papers through the submissions section. The articles that do not follow the rules of the template will not be evaluated at all. 5. Article Processing Fee: There is no fee for manuscript submission. After the successful review process, prior to publication of the accepted paper, the corresponding author will be expected to send 300 TRY.